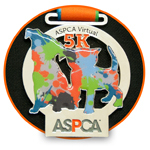 This June, Isaac, Steve, and I will be participating in the inaugural ASPCA Virtual 5K. We're excited to be participating in order to jumpstart a good habit of running with Isaac as company, but most of all we're in this to raise awareness and much needed funding for the ASPCA. Their programs are so vital to the fight against animal cruelty and provide services to millions of animals nationwide. Any donation would be so appreciated and will keep us motivated to run, run, run. Isaac sends his thanks too, as running is already one of his favorite hobbies and he is beside himself that he gets to do it more. We'll be doing our official 5K run on Saturday, June 24 in Prospect Park! In the meantime, we promise to keep social media replenished with Isaac in cute workout gear. Happy running and thank you so much for your support!